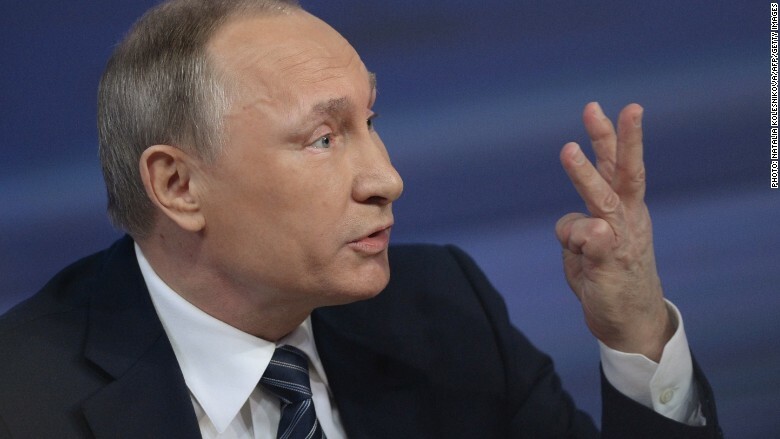 Vladimir Putin has an upbeat message for Russians: Everything is going to be fine. The Russian president said Thursday the worst is now behind his country after a year in which vital oil revenues collapsed and the economy plunged into a deep recession. "The Russian economy has passed the crisis, at least the peak of the crisis," he told journalists during his annual televised press conference. Putin said the government expects the economy to grow by 0.7% in 2016 and by 1.9% in 2017. But the country's central bank and independent economists are a lot less optimistic about the future. The Bank of Russia expects GDP to continue shrinking next year. "The latest batch of Russian activity data show that the recovery slowed last month and, worryingly, this came before the latest fall in oil prices," Liza Ermolenko, emerging market economist at Capital Economics, wrote in a note. Russian industrial production fell 3.5% in November compared to the same month last year. Retail sales slumped 13%, indicating that ordinary Russians are still feeling the pain. The ruble has fallen 6% against the dollar in the past month alone, and is now back near record lows. Putin said his forecast is based on the assumption that Russia will be able to sell oil for $50 per barrel in 2016, and he admitted that's an optimistic forecast. Oil is currently trading just above $35 per barrel. The slump in oil prices is forcing his government to revise its economic strategy. "We'll probably have to adjust something here... the government is certainly preparing scenarios for any economic development," Putin said. His finance minister said earlier this week that Russia should be prepared for oil to hit $30. Oil and gas exports form almost half of government revenue. A $10 drop in oil prices costs the Russian government roughly $14 billion in revenues, according to state-run news agencies.